The Mitchell B-25 Bomber was used in all theaters of World War II and became infamous for a top secret carrier-launch against Japan known as The Doolittle Raid. With the support of it’s dedicated crew and organizations like the Disabled American Veterans (DAV.org), the B-25J continues a flying mission of service – supporting the US Armed Forces’ disabled veterans and their families, through community outreach at air shows across the country. 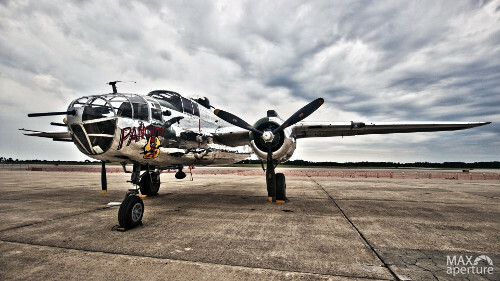 Panchito was filmed on location at the 2012 Portsmouth-Boston Air Show and is presented by Larry Kelley and Lynn May of the DAV Flight Team.